In January 2012 and 2013, Acharya William McKeever attended and assisted with the winter dathuns at Karme Choling. During both of these retreats he presented two talks, which were read by a ‘surrogate voice.’ What follows is Acharya McKeever’s advice to the retreatants on how to carry the practice out into their lives. The talk was given near the end of the January 2013 dathun. “Joyful to have such a human birth. Difficult to find, free and well favored. But death is real. It comes without warning. This body will be a corpse. Unalterable are the laws of Karma. Cause and effect cannot be escaped. 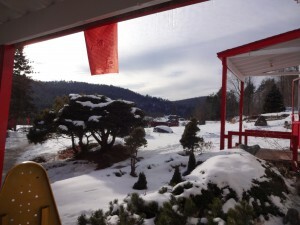 In 1972, I met the Buddha in person — the Vidyadhara, Chogyam Trungpa Rinpoche — here at Karme Choling. And my life changed. For years, I reveled in the three jewels and the growth of Vajradhatu, Shambhala and Naropa Institute and was delighted to play some roles in this historic work. Working with a mahasiddha like Trungpa Rinpoche was the dream of a dream. Impermanence manifested like a thunderclap when Trungpa Rinpoche died in 1987. The world I had known and loved came to an end. However heartbroken we were upon the death of Trungpa Rinpoche, like so many others I have been delighted, and moved, and inspired by the manner in which his son, Sakyong Mipham, has succeeded him, and how the Shambhala teachings are flourishing amidst new generations. I was teaching a course called “Lineage and Devotion”. One night, Berkley had a vivid dream in which we were three or four generations in the future, and these future students were studying for an upcoming exam on lineage and devotion. One student asked another, “Trungpa Rinpoche, Trungpa Rinpoche – now who was he again?” Another student answered, “Oh, he was the one that came before the Great Mipham.” Yes, it was just a dream, but dreams can also be prophetic, as I suspect this one was. It certainly shifted the perspective of what is possible. As for me, throughout the 1970’s, 1980’s and well into the 1990’s I thought I would be able to practice and study and serve the mandala with increasing capability. Then I was diagnosed with Parkinson’s in 1996, when I was 45 years old. This was definitely not part of the “Me Plan.” After several years of denial, everything gradually and inexorably began to change. As this disease progresses, my energies and capabilities are increasingly impaired. Most challenging has been the progressive loss of my ability to communicate. Following brain surgery that successfully lessened the major symptoms of Parkinson’s, my voice has gradually disappeared. This has not been easy. This was most poignantly brought home to me last week when Acharya John offered the Refuge and Bodhisattva vows. Giving Refuge was my favorite ceremony that an acharya can do. To me it expresses the first formal turning from samsara and turning toward genuine spirituality. As such it encapsulates the potential of the entire spiritual path. The last time I was able to lead a dathun that included a Refuge ceremony was the summer of 2004 at Shambhala Mountain Center. Richard’s beautiful ceremony, and the look on the participants’ faces as they received their names, created a yearning in me that is impossible for me to describe. When I took Refuge, here at Karme Choling with Trungpa Rinpche in 1973, I was 22 years old. He gave me the name Peaceful Rishi. I believe this was the only time he gave the name ‘rishi.’ The rishis were the early pre-Buddhist Vedic sages and yogis. They were famous for never speaking, or rarely speaking. So when they did, people apparently took note. It makes me wonder what Trungpa Rinpoche knew of my current challenge back in 1973. Sir, thank you for speaking! What Ethan said. Love and kisses to you Bill! 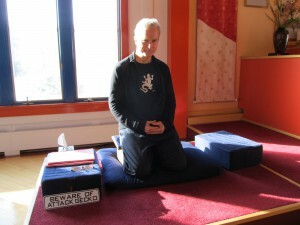 It was a real delight to have spent time in your presence practicing Mahamudra these past 9 days. I appreciate your stories and a wait for the next parts. Thanks, Bill, for a heartwarming and uplifting story of encouragment and bravery in the face of physical handicaps and fast-changing world of Shambhala teachings. Looking forward to many more tales from the Silent Rishi……. Thank you for your beautiful and powerful teaching, and for being an inspiration through your bravery and gentleness for all these years to so many. I also look forward to more. This is a wonderful exposition of the dharma — your stories are always so interesting and poignant. I can’t wait for parts 2, 3 & 4. Yes, now that you can only speak a little we all take note! Beautiful and inspiring example of what it means to be genuinely practicing the heart instructions of our Sakyongs. Thank you.